The eight-thousander Broad Peak (Lat / Lon: 35.81600 ° N / 76.56200 ° E), the 12th highest mountain in the world, lies in the middle of the “Shining Mountains”, the six highest mountain peaks of the Karakorum Mountains in Pakistan. The Broad Peak has three separate peaks: the main summit, 8051 m, the central summit 8016 m, and the north summit 7550 m. The approach to the more than 100 km long ice stream of the Baltoro Glacier, also known as the Karakorum Mega Trek, is in itself worth a trip. The goal of the expedition from June 11 to July 28, 2011 is to reach the 8047 m high main summit via the western ridge and the west flank using the normal route. In doing so, Luis Stitzinger would like to try to master a complete skiing experience of the mountain, an extreme descent with long steep slopes and slopes of over 55 degrees steepness in the most difficult passages. Originally by the British Lieutenant T.G. Montgomerie discovered and measured mountain in 1856 initially went under the name “K 3” in the first card. Only the also coming from Great Britain researcher W.M. Conway coined the term “Broad Peak” for the mountain in 1892, which he compared to the Swiss Breithorn and for the more than 2 km wide summit massif as appropriate. Since a common name for the mountain in the local dialects was not found, the name was later translated into Balti as “P’alchan Kangri”. At 8,047 m (26,400 feet), the main peak was measured in 1926 by the British Mason, the Italian Spoleto specified the height in 1929 at 8,051 m (26,414 feet). Finally, Günter Oscar Dyrenfurth, head of the legendary International Himalayan Expedition (IHE) of 1934, explored the area around Gasherbrum I and the west and south sides of Broad Peak and recognized the possibility of a route to Broad Peak over what he had named “West Spur”. 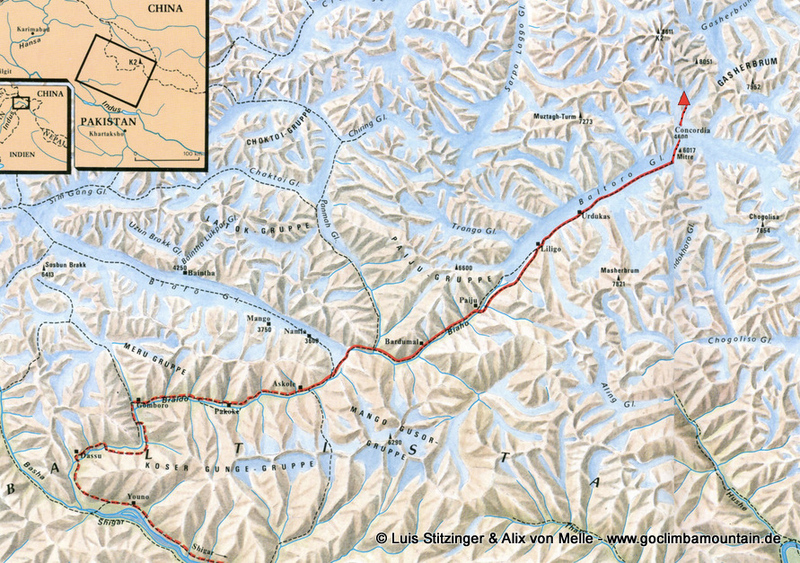 The first serious attempt on this route was made in 1954 by Karl-Maria Herrligkoffer. Herrligkoffer was a half-brother of Willy Merkl, who led the two German Nanga Parbat expeditions of 1932 and 1934. After several minor accidents and the onset of winter, Herrligkoffer finally decided to stop the expedition after two expedition members reached the 7200 m mark. A small Austrian team succeeded in 1957 finally the first ascent almost in the alpine style: Hermann Buhl, Fritz Wintersteller, Kurt Diemberger and Markus jewelry arrived without high beams and with little fixed rope on June 9, 1957 at the highest point of the mountain. A sensational performance for the time, benefiting from the preparatory work of the 1954 expedition. At 5 pm, Marcus Schmuck and Fritz Wintersteller reached the summit. About half an hour later Kurt Diemberger came after. On the way back, Diemberger met near the summit of Hermann Buhl, who had initially given up. Diemberger spontaneously returned and joined Hermann Buhl a second time to the summit, which they reached at sunset. During the subsequent attempt on the first ascent of the Chogolisa 7668 m, Buhl died in a fatal crash. In 1975, the 8016 m high central peak of a Polish expedition (Marek Kesicki, Bohdan Nowaczyk, Kazimierz Glazek, Janusz Kulis and Andrzej Sikorski), in 1983 the 7550 m high north summit of an Italian expedition led by Renato Casarotto. The fastest documented time of the mountain was achieved in 1984 by the Polish mountaineer Krzysztof Wielicki. He left the base camp at 4850 m at midnight, reached C1 at 4:00 am, C2 at 8:00 am, the saddle at 2:00 pm and the main summit at 4:00 pm. Covering the climb of 3150 Hm in less than 14 hours was an incredible achievement at the time. He completed the ascent with his return to base camp in just 22 hours. In 1994, the Mexican Carlos Carsolio single-handedly climbed the west wall and reached on 9.7. the summit. In 2005, the Kazakhs Denis Urubko and S. Samoilow from 19. to 25.7. the southwest wall in alpine style. In 2009, the two Munich speed mountaineers Benedikt Böhm and Sebastian Haag tried to break Wielicki’s record. Poor conditions, deep snow and cold temperatures made your life difficult, but they reached the summit after 16 hours, 8027 m, but decided there due to too advanced time and a bad weather forecast for a demolition and got back after a total of 39 hours to the base camp. 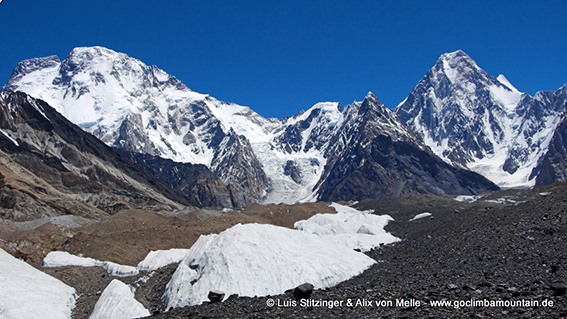 The Konkordiaplatz, the junction of the Baltora and Godwin Austen glaciers, the scene of K2 (8611 m), Gasherbrum IV (7925 m) and Chogolisa (7665 m), lies directly at the foot of Broad Peak (8051 m). From the base camp (4900 m) you cross the mighty Godwin-Austen glacier for a while and then climb into the west flank of the mountain. For the first high camp (C1, 6050 m) consistently steep slopes of 40-45 degrees must be expected, much of the route must be secured with fixed ropes. A snow crest interspersed with rock girders conveys the way to the second high camp (C2, 6900 m), which is located above a 200 m high snow flank. Also on this route a lot of fixed rope has to be laid in order to secure crash-prone passages. To the high camp 3 (C3, 7300 m), the terrain continues after a rock bar back and forth and the last four hundred vertical meters lead over a wide glacier back to the campsite. At the summit stage, a large glacier sink is initially gained over extensive slopes. The broad snow channel leading from there into the saddle (7850 m) between the main and central summits continues to rise in its course (average 40 degrees, up to a maximum of 55 degrees steepness). From the saddle you follow the partly exposed and rocky ridge (up to III after UIAA) to the pre-summit (8035 m). From there it is still about a good hour without much height gain or difficulty until the main summit (8051 m) is finally reached. 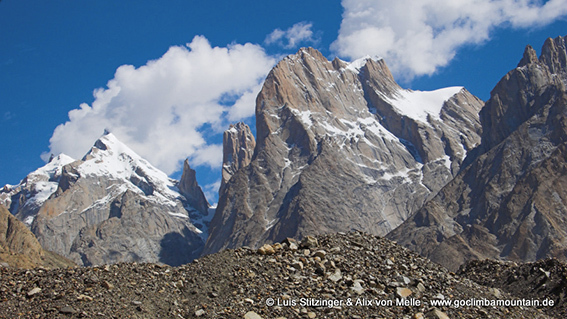 From Islamabad you fly to Skardu (2300m), the administrative center of the Baltoro area. There is a one-day stop, walks and sightseeing around the interesting capital of Baltistan. Now it goes with all-terrain vehicles through the Shigar valley to Dasu. In good conditions, you can continue through the Braldu gorge to Askole (3050 m). However, if the river floods, it is already at Thongal (2885 m) end and it must be continued from here on foot. Here begins the total of six-day trekking to the base camp. Continue along the Braldu River and continue over Jola (3050 m) to Paiju (3400 m), the last green oasis before entering the Baltoro Glacier. After a day of rest and organization for the porters, the journey through the gigantic glacier stream begins on a sometimes arduous journey. 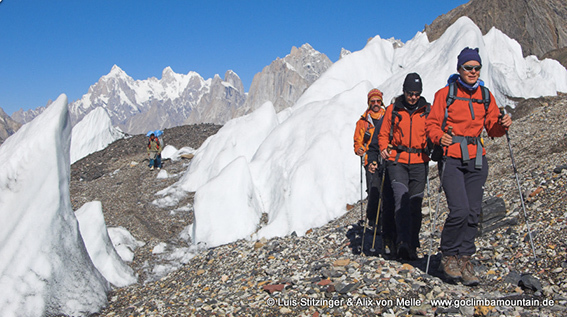 The unique glacier scenery and the views of the surrounding mountains, such as the Trango towers or the Muztagh Tower, make up for more than just the effort. In Urdokas (4050m) and Gore II (4250 m) are the other camps. While Urdokas still looks like a veritable oasis in the high mountain desert, Gore II lies amidst coarse boulders and ice towers on the rubble-strewn Baltoro Glacier. 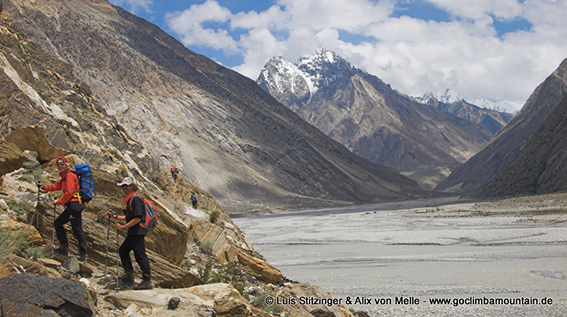 Penultimate stage in front of Konkordiaplatz, trekking near Gore II 4250 m.
Then the Konkordiaplatz is reached, junction of Baltoro- and Godwin- Austen Glacier, scene of K2 (8611 m), Gasherbrum IV (7925 m), Chogolisa (7665 m) and „our mountain“ – the Broad Peak (8051 m). After the last trekking day, the base camp will be set up at about 4900 m and the ascent begins. After the end of the adventure and the dismantling of the storage chain, the four-day return journey over the Gondogoro La, 5650 m, to Hushe (3050 m) and continues to Skardu. If it is not possible to return via the Gondogoro Pass, you will march back to Askole on the well-known ascent route with about the same amount of time. and then returned to Skardu. Day 1: Departure with Etihad Airlines from Munich via Abu Dhabi, UAE, to Islamabad, Pakistan. Day 2: Arrival in Islamabad, 650 m, the modern capital of Pakistan. One of the final preparations for the expedition is the briefing at the authorities. We check our equipment and sort the luggage. In the afternoon there is still time for a short sightseeing program in the “Twin Cities” Rawalpindi and Islamabad. Day 4: Acclimatization day, a walk to Skardu Fortress promotes this. Last organizational measures are to be taken. 6-11th Day: The trekking to Basecamp, 4900 m, starts slowly. We march for three days along the Braldus valley, passing Johla, 3050 m, and Paiju, 3380 m, before we reach the mighty ice flow of the Baltoro glacier. In three more days we reach Urdukas (4050 m) and Goro II (4250 m) via steep moraines and rubble-covered glaciers, finally reaching the spectacular Konkordiaplatz at 4600 meters. A little further up the Godwin-Austen glacier, the tents for the base camp of “our mountain”, 4900 m, are erected on the lateral moraine. Day 12.-41.: The ascent of Broad Peak, 8051m, takes us now for a full 30 days. Enough time to improve acclimatization and set up the high-altitude warp chain. We commute several times between the three high camps (C1 6050 m, C2 6900 m, C3 7300 m) before we are prepared for the ascent to the summit. Most of the climb goes over the steep west ridge and the west flank until it reaches the high ridge between the main and central peaks of Broad Peak. The last meters lead exposed and time-consuming over the north and northwest ridge to the summit. Day 42.-45.: Trekking and drive back to Skardu via the Gondogoro Pass, 5650 m, in four days via Ali Camp, 4850 m, Shuspang, 4600 m, and Siacho, 3300 m, to Hushe, 3050 m. From there you can continue by jeep to Skardu. If the crossing is not possible, the route will take you to Askole via Goro I, 4080 m and Paiju, 3370 m, in four days, then continue with the Jeep. Day 47: Day in Islamabad for the debriefing at the Alpine Club and organizational matters. Day 48: Check-in for the return flight via Abu Dhabi, arrival in Frankfurt.